Steve is the one in the Black Label Society (BLS) tee shirt saying "feels like a Taylor"
This CD is a three color screen print for the San Diego metal band Narsil. The "blood" splatter was made by thinning a little cad red medium in a bottle and dripping it on to a piece of card stock. After it dried I scanned it and placed it on a black background in photoshop. Then in photoshop i took some of the blood spatter, made it black splatter and placed it on top the red giving it a deeper look. 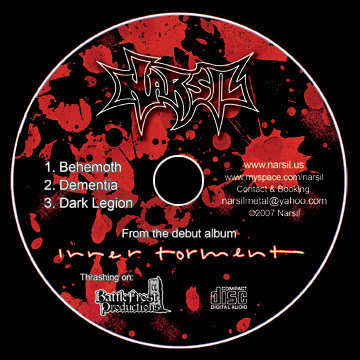 Currently im working on the design for Narsils full length album "Inner Torment". The cover art and cd art are done and I'm now working on the guts of the booklet. 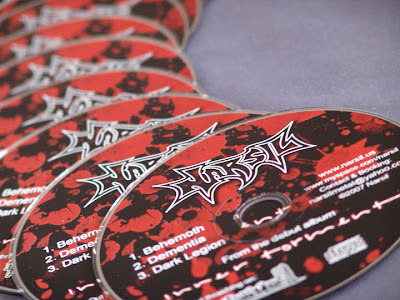 All the text for the album will be hand written like the text in the title (Inner Torment) seen on the demo.